Chimbu deven loves comedy. a�?Having worked as a cartoonist in Ananda Vikatan, it is natural that I have an inclination for it,a�? he says. A fact echoed in his filmographya��four out of his five films fall under that genre. His latest, Puli, is probably the only exception. But then again, if it is an out-and-out Vijay a�?rasikara�? film, as he claims, a generous helping of laughs is to be expected, too. The director is also rather captivated by quirky movie titles. It ranges from the obscure Imsai Arasan 23m Pulikesi (2006), Arai En 305-il Kadavul (2008), Irumbukkottai Murattu Singam (2010,Oru Kanniyum Moonu Kalavaniyum (2014) and now to the ubiquitous Puli. Oh yes, he loves fantasy as well. They form the backdrop of all his films. Deven takes us through the journey of Puli. He starts with an apology. a�?I have certain restrictions to talk.a�? But of course! Puli, he tells me, was a script that was written with specific actors in minda��be it Vijay, Sridevi or Kicha Sudeepa��because they fit that role. It seemsA� Vijay said a�?everyone will love the script,a�? and once he gave the nod, it was easier to rope in producers and the other actors. The director says that Sridevi, who was tired of the scripts she was reading post English Vinglish, immediately agreed to be a part of it, as did Kannada superstar Sudeep. a�?Though he was initially hesitant to play a villain, he was keen once he heard the story,a�? says Deven, who earlier worked as an assistant director to filmmaker Cheran (Vetri Kodi Kattu). Getting a strong technical team was equally crucial, he admits. But, luckily for him, that too came together easily. With Natarajan Subramaniyan aka Natty (cinematographer), Sreekar Prasad (editor) T Muthuraj (production designer) and Kamal Kannan (graphics), he had a solid tech team. He cannot stop raving about his Puli hero. a�?Vijay sir is a perfectionist. He comes on time and insists on perfecting every minute detail. I learned a lot by watching him,a�? he says. When I try to prod him about the story, he smiles, a�?Dona��t ask me about it. I am not telling you.a�? Visibly excited about the blend of graphics and art direction, he says, a�?That was most important and it has come out nicely.a�? As for the filma��s music, he says music director Devi Sree Prasad, is an a�?energy balla�? who gave him a�?single tunesa�? for the songs. Quiz him about a recent favourite film and he pauses before settling for Robo Cop and adds that he is a huge fan of Alfred Hichcock. 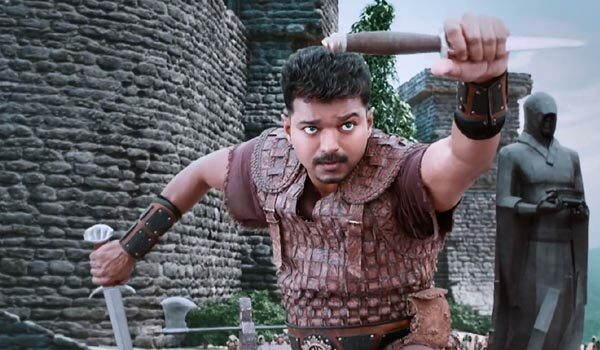 a�?The trailer of Puli will release today. You watch it and tell me how it is,a�? he signs off.